Romuald Twardowski was born in Vilnius, Lithuania in 1930. He studied violin there during the war years of German occupation. He later studied piano and organ and in 1957 graduated from the Lithuanian State Conservatory, following which he relocated to Poland. After winning a composer’s competition there in 1961, he went to Paris for studies in composition with Nadia Boulanger. His music, as represented here, is both conservative and highly colourful, sounding more like the work of a composer from the mid-20th century who has turned away from atonality and other progressive movements while absorbing different mainstream styles of the time with chameleonic facility. Here his music often exudes ethnic features, as in the Spanish Fantasia and Niggunim. The Capriccio in Blue is actually less Gershwinian in style than you would think: it demomstrates Gershwin’s influence in its jazzy rhythms and harmonies alright, but shows us more about Twardowski’s own individual take on jazz and the blues. The Serenade for String Orchestra also has jazz and blues characteristics, particularly in the second movement. But the work is perhaps somewhat redolent of the style of the late Polish composer Andrzej Panufnik who used jazz elements in his music: try the Sinfonia Rustica (Symphony No. 1; 1948, rev. 1955) and the 1963 Sinfonia Sacra (Symphony No. 3). Similarities may only be coincidental, but I suspect Twardowski was familiar with Panunik’s music (the Symphony No. 3 quickly became very popular in Poland and abroad) and he very possibly absorbed something from it. 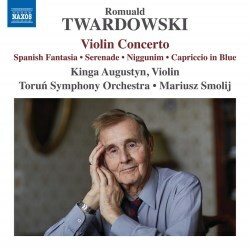 The Concerto for Violin is the most cosmopolitan work on the disc, even if it shows the influence of a popular Polish composer, Henryk Gorecki, in its tendency to follow a more direct and simple manner of expression, an approach typically associated with that late composer and contemporary of Twardowski. The Concerto is arguably the most substantive work in this collection as well and the only one originally conceived for violin and orchestra, as the Spanish Fantasia, Niggunim and Capriccio in Blue were first written for violin and piano, then later given orchestral versions. The Concerto’s first movement is the most serious of the three panels: it begins and ends darkly and inbetween the music yields much warmth but also a restless, uneasy character. The brief middle movement is quite beautiful and serene, while the colorful finale is witty and playful, though detouring midway through to a lengthy, quite challenging and soberingly dramatic cadenza. In the four very disparate works for violin and orchestra here Kinga Augustyn is quite amazing, bringing to life music of merit that otherwise might languish in total obscurity. Last year I praised her Telemann disc (review), and another, of the Paganini Caprices on Roven Records from 2016, was equally impressive. In the two-movement Spanish Fantasia Ms. Augustyn and the orchestra infuse the music with energy and incandescence and evince a sun-filled Spain in all its prismatic harmonies and rhythms. The violinist manipulates her tone so deftly, makes the music dance with resilience, and subtly accents and caresses phrases to great effect, all to capture convincingly the Andalusian spirit. She delivers a brilliant account of the second movement cadenza. By the way, the composer uses only original themes in this work, which is testimony to how thoroughly he soaked up the native music styles during a sojourn in Spain. Ms. Augustyn’s accounts of Niggunim and Capriccio in Blue are equally convincing, offering further evidence of her uncanny ability to interpret effectively totally different styles of music, to move seamlessly with idiomatic genuineness from Spanish to Hasidic music and then to the blues. But her performance of the Concerto may be the most impressive here. She captures perfectly the emotional tenor and signature character of each movement: the dark lyricism and disquiet of the first, the tranquil beauty of the second, and brilliance and wit of the finale. Try her stunning account of the cadenza in the finale, played about as well as one can imagine. Mariusz Smolij and the Toruń Symphony Orchestra offer more than just competent accompaniment, as they too adjust facilely to the wide-ranging styles Twardowski presents. In the Serenade, the one work not featuring Ms. Augustyn, the conductor and the orchestra’s string section deliver a vital and accurate performance. The sound reproduction is clear and well balanced in all works. These compositions may not be great masterpieces but they are quite fine nevertheless, and I would say that at least the Concerto and the Spanish Fantasia deserve far greater attention. As for Ms. Augustyn, she is emerging as a rare talent, perhaps soon to be a major star of the concert stage.